Surprisingly, with a little touchup work to remove some of the reflections, the photos provide some insight into the travel challenges faced by Peruvians as they go about their daily lives. The Falkland Islands: Our Perceptions of the Islands. Peru, a view through the glass of planes, trains, and buses. 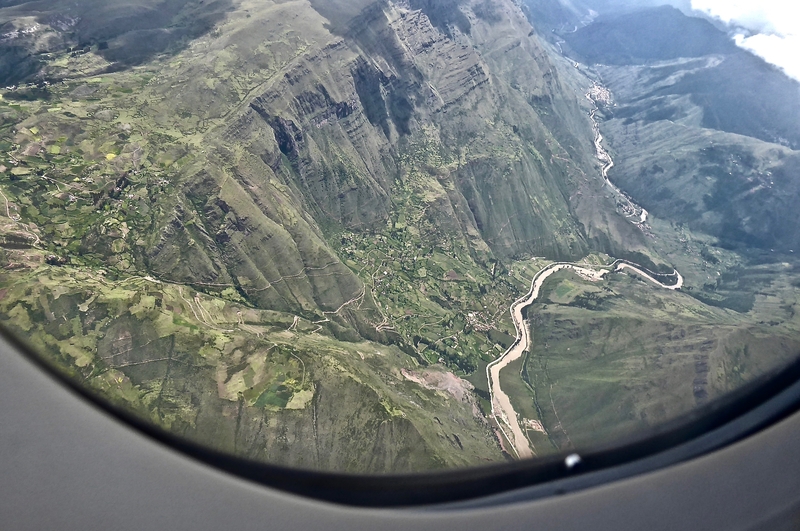 As we flew to Cusco, the religious centre of the Inka (original spelling) culture and the gateway to Machu Picchu, breaks in the clouds presented our first opportunity to view Peru from a 32,000-foot perspective. The enhanced introductory photos that serve as the lead in this slideshow, reveal the rugged terrain where people most certainly live and work at the top of the world. That world ranges from sea level to 16,700 feet. Eight of the ten highest mines in the world are located in Peru, with the town of La Rinconada, 30,000 residents, sitting at the 16,700-foot level, the highest town in the world. 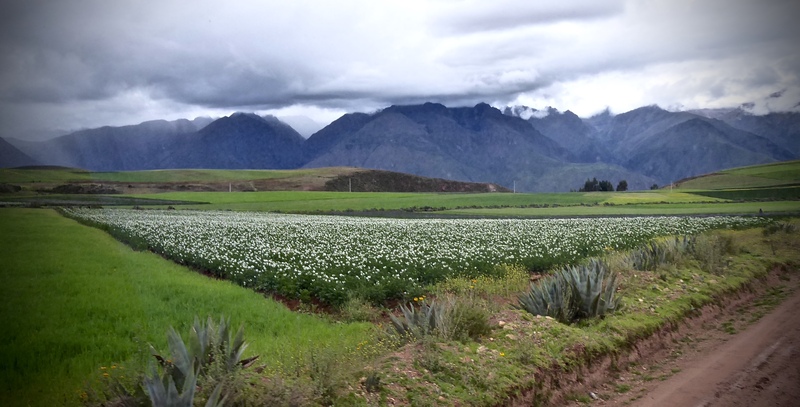 The majority of staple crops in Peru are cultivated from 1,000 meters (3200 feet) to 3,900 meters (almost 13,000 feet) with several hundred varieties of potatoes being developed and are shipped around the world. Quinoa, another staple of Peru, is grown from about 2,300 metres (7500 feet) to 3,900 metres (13,000 feet). Maize, another principle crop, is commonly grown to the 3,500 meters (11,500 feet) in favourable conditions. It was the ingenuity of the ancestors of the Peruvian people (the Inca’s and others) in developing crop strains that grew well under adverse conditions, that allowed them to feed the people with less than 2% of land in the country suitable for agricultural use. “The highest altitude in the Andes at which people have resided permanently is 17,100 feet (shepherds in southern Peru) and, as temporary workers, 18,500 to 19,000 feet (Carrasco Mine, in the Atacama Desert, Chile).” (The Mountain People). In several of the lead photos, you can discern the switchback network leading from one community to the next and when traveling by bus, we seldom covered more than a few kilometers with entering a network of switchbacks. In one photo, I happened to capture an open pit mine and in another a dust cloud that appears to be from another mine. Later, when travelling by bus, a perplexing question arose – why were so many towns completely devoid of people. I’m not just talking about only a few people on the streets, often there was not a single a sole to be seen. Perhaps everyone left for work before we arrived (late morning) and never came home until late in the afternoon (after we left)? On landing in Cusco, we had our first taste of life at 11,500 feet, and after walking a short distance from the aircraft to the departure lounge, we begin to feel the effects. It would be good to have the next two days to acclimatize.